It’s so very wonderful to learn this week that “median household income” in 2014 was $53,657, even if it was down from $57,843 in 1999. You can still buy a nice basket of goodies on $50 grand a year. If only it were true. Most jobs pay about $31k. Many families have just one parent or one spouse working. Something doesn’t add up. Welcome to the world of making statistics lie to fool the peons into believing serfdom is almost as good as living in a castle. The value of the free lunches your children eat in school. The estimated net price of the Medicaid and Medicare received for healthcare. Pensions, unemployment insurance, welfare, workman’s comp. Social Security retirement and disability payments. Tax refunds, alimony and childcare payments to you. Supplemental Social Security and Earned Income Tax Credit. Heating and utility subsidies for the poor. Women’s and children’s subsidized clinic care. The estimated value of government-provided childcare. Employer cost of healthcare premiums, pension payments and insurance. 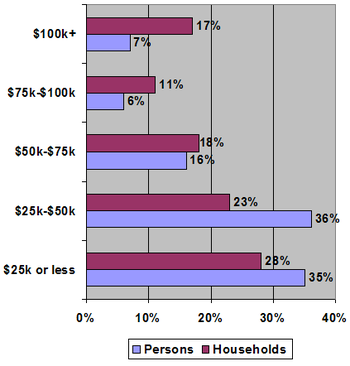 Altogether there are 49 different sources of “household income” and many of them are substantial. For example, a healthcare plan like Medicaid for a family has to be worth $6,000 a year, even more since it has no $6k deductible and pays nearly 100% for everything from dental to eyeglasses. Grandma living with you? Add her pitiful Social Security payments to your household income. Win $50 in the lottery. Add it on to the total. It is easy to estimate that household income for a family earning $20k – eligible for many poverty line benefits – will have a government estimated “household income” twice actual wages. One conservative stink tank study showed a minimum wage worker with two children receives a real household income of $58k, but even $40k means a massive distortion of the mean income of Americans. However, household income is also used by the government to show the rich aren’t really as rich as we “little people” would like to believe. The deal with the wealthy is to use rules to reduce their household income, so it doesn’t appear so huge. This is how that’s accomplished. Sale of stocks, bonds and real estate are not household income. All income, property and other taxes are used to reduce income. Withdrawals from savings and other accounts are not household income. The result of all this number manipulation? The poor look richer. The rich look poorer. Proving once again that the road to false equality is paved with bad statistics, and not always good intentions.